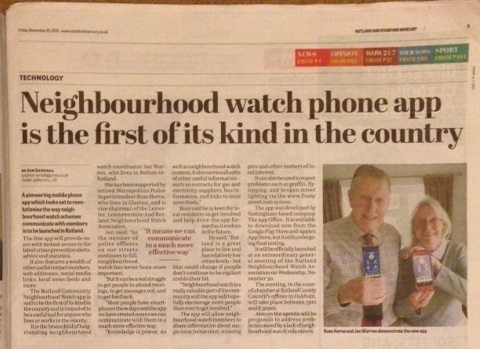 Home » NHW News » Press » Launch of Rutland NHW smartphone app. It is with great pleasure I draw to your attention the recent launch (30th November), in Oakham, of the Rutland Neighbourhood Watch and Community smartphone ‘app’, specifically for Rutland. It is the first of its kind in the country, and provides an excellent way to help address crime and anti-social behaviour. It makes crime and community safety related information more accessible, and by sharing vital local news and providing a wealth of the latest information, it enables you to make better decisions about your home, family, and neighbourhood. ​​In addition, the ‘app’ has four ‘quick help’ lines to: the Emergency Services, Crimestoppers, Domestic Abuse Support, and Childline/NSPCC. It has no advertisements. Please check the lin below. Scroll down and tap the ‘Preview App’ to see the various services offered. I think you will be pleasantly surprised. It is not confined to Neighbourhood Watch members, and may be downloaded free by any resident or worker in Rutland; if you like it, please draw it to the attention of your friends, there is even a button to share it. The app is registered and approved by both Google and Apple. If you have an Android smartphone, download from the Google Play app store, whilst if you have an iPhone, you contact the Apple App Store. There, search for ‘Rutland NHW app’ or click the appropriate link on the website given above. ​This is the brainchild of a local Neighbourhood Watch Coordinator, Jan Warren, who was assisted by local NHW volunteers over about 12 months, their services were entirely free. Technical design was by The App Office, NOttingham (see above link). It will be administered by local volunteers, who are currently under training, so initially, please make allowances for this. Previous post Rutland’s neighbourhood app is the first of its kind in the country.